The majority of Bhutan’s Buddhists are adherents of the Drukpa subsect of the Kargyupa (literally, oral transmission) school, one of the four major schools of Tibetan Buddhism, which is itself a combination of the Theravada (monastic), Mahayana (messianic), and Tantrayana (apocalyptic) forms of Buddhism. Tibetan Buddhism holds that salvation can be achieved through the intercession of compassionate bodhisattvas (enlightened ones) who have delayed their own entry into a state of nibbana (see Glossary), or nirvana, enlightenment and selfless bliss, to save others. Emphasis is put on the doctrine of the cosmic Buddha, of whom the historical Buddha—Siddhartha Gautama (ca. 563-ca. 483 B.C. )—was only one of many manifestations. Bodhisattvas are in practice treated more as deities than as enlightened human beings and occupy the center of a richly polytheistic universe of subordinate deities; opposing, converted, and reformed demons; wandering ghosts; and saintly humans that reflects the shamanistic folk religion of the regions into which Buddhism expanded. Tantrism contributed esoteric techniques of meditation and a repertoire of sacred icons, phrases, gestures, and rituals that easily lent themselves to practical (rather than transcendental) and magical interpretation. The Kargyupa school was introduced into Tibet from India and into Bhutan from Tibet in the eleventh century. The central teaching of the Kargyupa school is meditation on mahamudra (Sanskrit for great seal), a concept tying the realization of emptiness to freedom from reincarnation. Also central to the Kargyupa school are the dharma (laws of nature, all that exists, real or imaginary), which consist of six Tantric meditative practices teaching bodily self-control so as to achieve nirvana. One of the key aspects of the Kargyupa school is the direct transmission of the tenets of the faith from teacher to disciple. The Drukpa subsect, which grew out of one of the four Kargyupa sects, was the preeminent religious belief in Bhutan by the end of the twelfth century (see Origins and Early Settlement, A.D. 600-1600, this ch.). Monasteries and convents were common throughout Bhutan in the late twentieth century. Both monks and nuns kept their heads shaved and wore distinguishing maroon robes. Their days were spent in study and meditation but also in the performance of rituals honoring various bodhisattvas, praying for the dead, and seeking divine intercession on behalf of the ill. Some of their prayers involved chants and singing accompanied by conch shell trumpets, thighbone trumpets (made from human thighbones), metal horns up to three meters long, large standing drums and cymbals, hand bells, temple bells, gongs, and wooden sticks. Such monastic music and singing, not normally heard by the general public, has been reported to have «great virility» and to be more melodious than its Tibetan monotone counterparts. To bring Buddhism to the people, numerous symbols and structures are employed. Religious monuments, prayer walls, prayer flags, and sacred mantras carved in stone hillsides were prevalent in the early 1990s. Among the religious monuments are chorten, the Bhutanese version of the Indian stupa. They range from simple rectangular «house» chorten to complex edifices with ornate steps, doors, domes, and spires. Some are decorated with the Buddha’s eyes that see in all directions simultaneously. These earth, brick, or stone structures commemorate deceased kings, Buddhist saints, venerable monks, and other notables, and sometimes they serve as reliquaries. Prayer walls are made of laid or piled stone and inscribed with Tantric prayers. Prayers printed with woodblocks on cloth are made into tall, narrow, colorful prayer flags, which are then mounted on long poles and placed both at holy sites and at dangerous locations to ward off demons and to benefit the spirits of the dead. To help propagate the faith, itinerant monks travel from village to village carrying portable shrines with many small doors, which open to reveal statues and images of the Buddha, bodhisattavas, and notable lamas. Before the introduction of Buddhism, animistic worship, generally categorized as Bon in the Himalayas, was prevalent in Bhutan. The sun, moon, sky, and other natural elements were worshiped, and doctrine was transmitted orally from generation to generation. Bon, from a Tibetan word meaning invocation or recitation, has priests—bonpo—who perform exorcisms, burial rites, and divinations to tame threatening demons and to understand the wishes of the gods. Imported from Tibet and India, perhaps in the eighth century, Bon doctrine became so strongly reinvigorated by Buddhism that by the eleventh century it reasserted itself as an independent school apart from Buddhism. Conversely, Bon influenced popular Buddhism, infusing it with an appreciation for omens and demons felt to influence daily life profoundly. 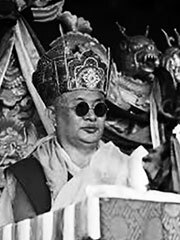 Bon established a canon of teachings and continued to be practiced in modern Bhutan.